On October 13, the Society of Saint Pius X issued a communiqué on the utterly ersatz “canonization” of Pope Paul VI that was scheduled to take place (and did) on the following day in Rome. It is a most unfortunate text; indeed, nothing less than a massive failure. 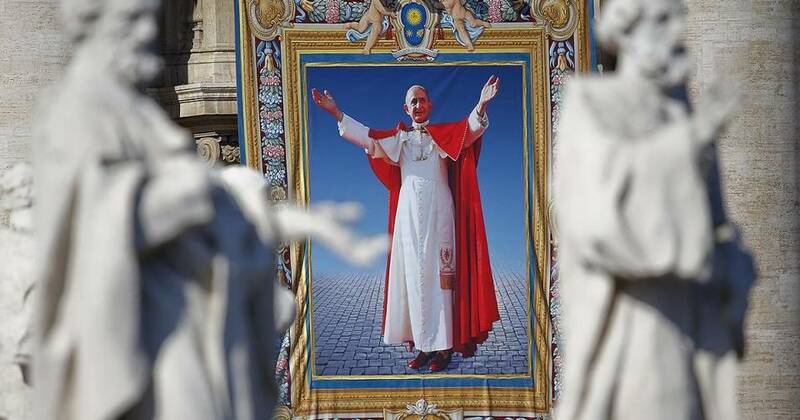 These beatifications and canonisations of recent popes, with an accelerated procedure, dispense with the wisdom of the Church’s centuries-old rules. Is not their aim more to canonise the popes of the Second Vatican Council, rather than to note the heroicity of their theological virtues? When one knows that the first duty of a pope – successor of Peter – is to confirm his brethren in the faith (St Luke 22:32), there is a good reason to be perplexed. This is exactly backwards. It is far more accurate to say: When one is steeped in Catholic tradition, there is no reason to be perplexed by these events. We know exactly what is going on – Rome has lost the faith! I, for one, am sick to death of seeing would-be defenders of tradition play the “confusion” card in the face of what are obvious assaults against the true Faith. Please, this is no time for cute rhetorical questions. We know damned well what their aim is, and that knowledge should inspire righteous outrage on the part of every Soldier for Christ and nothing less. Even so, the communiqué’s tone is disgustingly diplomatic; it is an overt attempt to come off as fair and balanced, to what end, is anyone’s guess. After tiptoeing through the tulips in the opening paragraph, the text (signed only “Menzingen, October 13th, 2018”) goes on to carefully list Paul VI’s supposed accomplishments. Only then does it mention certain of his magnificent faults, which I see no need to applaud given what I am about to highlight. It is true that Paul VI was responsible for the encyclical Humanae Vitae (July 25th, 1968), which instructed and consoled Catholic families at a time when the most basic principles of marriage were under bitter attack. He [Paul VI] was also the author of the Credo of the People of God (June 30th, 1968) by which he wanted to emphasise the articles of Catholic faith challenged by the progressivism ambient, in particular in the scandalous Dutch Catechism (1966). Nonsense! The so-called Credo of the People of God is a prime example of the progressivism ambient! Needless to say, those “developments” are of the conciliar kind; that is, the kind vigorously opposed by Archbishop Lefebvre and the Priestly Society that he established; at least at one time. We give thanks, however, to the divine goodness that very many believers can testify with us before men to the unity of God, even though they know not the mystery of the most holy Trinity. This is nothing less than a show of deference to those who plainly reject Jesus Christ; in particular, the Muslims and the Jews. Here, Paul VI is echoing the sentiments expressed in the conciliar document, Nostra Aetate. And this is what the recent SSPX communiqué considers an example of Paul VI emphasizing the articles of Catholic faith? Under Pontius Pilate He suffered—the Lamb of God bearing on Himself the sins of the world, and He died for us on the cross, saving us by His redeeming blood. Sounds good, right? Wrong. Note the convolution between redemption and salvation; one that is well in keeping with the Protestant error that considers Christians “once saved, always saved.” Inadvertent? Hardly. And then there’s the Credo’s twisted ecclesiology. … the Church on earth, the pilgrim People of God here below, and the Church filled with heavenly blessings the Church on earth, the pilgrim People of God here below, and the Church filled with heavenly blessings; the germ and the first fruits of the Kingdom of God … We believe in the communion of all the faithful of Christ, those who are pilgrims on earth, the dead who are attaining their purification, and the blessed in heaven, all together forming one Church. So much for the Church Militant, the Church Suffering and the Church Triumphant. Furthermore, the Catholic Church is not merely the “germ” of the Kingdom of God; i.e., that which is evolving into said Kingdom. Contrast Montini’s profession with the words of Pope Pius XI who spoke of “the Catholic Church, which is the Kingdom of Christ on earth.” (cf QuasPrimas) Paul VI dared not reiterate this article of Catholic faith, however, well… because… ecumenism. No, not just “begun here,” but rather, is here. This, of course, is the same Paul VI who affirmed his conciliar confreres in declaring that the Church of Christ merely subsists in the Catholic Church. (LG 8) As such, it comes as no surprise that the ecclesiology presented in his Credo is empty. This brings us to Paul VI’s treatment of the Mass, and it’s just as one might expect. Of particular note are his words concerning the priest and his actions as carried out within the Mass. We believe that the Mass, celebrated by the priest representing the person of Christ by virtue of the power received through the Sacrament of Orders, and offered by him in the name of Christ and the members of His Mystical Body, is the sacrifice of Calvary rendered sacramentally present on our altars. No, the priest does not simply represent the person of Christ at Holy Mass; rather, he acts in persona Christi in so profound a way that it is Christ Himself who offers the Holy Sacrifice, which is not merely offered by the priest “in the name of Christ” as the Credo maintains. God forbid a sincere seeker of truth, disturbed by the “canonization” of Paul VI, should come to the Society’s website looking for answers. By highlighting Humanae Vitae and the Credo of the People of God in a positive light, the SSPX has failed the faithful miserably. Let us pray that the Society of St. Pius X will soon regain its vigor. Matthew, I hope you realize your post, above, is very difficult to read. There is no distinction between your own words and those of the "communique" you're referring to. Most casual readers unfamiliar with your style would have no idea where one stops and the other starts. There are no paragraph indents or skipped spaces to separate paragraphs, like this. Please consider re-organizing what you posted so new visitors can make heads-or-tails out of what you're trying to present. I just went to the source site and found that the words I had thought were yours are actually those of Louie Verrechio. His formatting makes it all comprehensible -- but when you just copy-and-paste that into the CI window, all the formatting disappears. It would be a great help if CI allowed tab stops so we could offset quotations instead of having to rely on quote boxes, which are very annoying. Louie appears rather perplexed with respect to the SSPX. When one is steeped in Catholic tradition, there is no reason to be perplexed by these events. We know exactly what is going on – Rome Menzingen has lost the faith! It's all just a copy-paste from the article. There are no words from me. The Conciliar Church wanted to become more acceptable to (and hence more like) the World, and lost it. The SSPX wanted to become more acceptable to (and hence more like) the Conciliar Church, and lost it. History doesn't repeat, but it does rhyme. How about a copy of the thing everyone is upset about? — It is true that Paul VI was responsible for the encyclical Humanae Vitae (July 25th, 1968 ), which instructed and consoled Catholic families at a time when the most basic principles of marriage were under bitter attack. He was also the author of the Credo of the People of God (June 30th, 1968 ) by which he wanted to emphasise the articles of Catholic faith challenged by the progressivism ambient, in particular in the scandalous Dutch Catechism (1966). He was in charge for 15 years during the peak destruction years of the Church. It was so bad that this is about all the "good" that the SSPX can come up with to hand to the conciliar church in this critique. I say "good" because they are not really good, they are only "good" relative to everything else that he did. Humanae Vitae was at best an ambiguous bone thrown to the traditionalists, with some poison mixed in. Any knowledgeable traditionalist knows that about Humanae Vitae, which does not say much about the SSPX clergy as sources of knowledge. In a big way HV is almost foundational for the New Religion, apparently traditional, yet muddles the ends of marriage, and Bergoglian / UN / Masonic memes like alleged overpopulation get a starring role. Humanae Vitae was an overall flop in the emerging Newchurch. Progressives hated it so they took every opportunity to IGNORE it. The more conservative-leaning priests tried to present it in a favorable light in hopes that it would discourage use of contraception. All along, the most staunch conservatives criticized HV for the erroneous conflation of unitive vs procreative purposes of marriage. Through the years, one could most readily tell the leanings of any priest by asking him one question regarding HV. Less than 5 years later, HV did nothing to stop the plague of Roe vs. Wade (Jan 22nd, 1973). The guiding maxim of the SSPX: If you can't say something nice, then don't say anything at all.